Inihaw na Liempo (Grilled Pork Belly) Recipe – Eats Yummy! 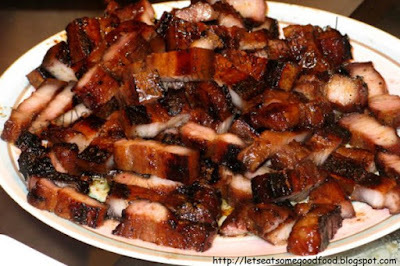 One of the easiest pork belly recipes, Inihaw na Liempo (Grilled Pork Belly), is a popular dish not only in the Philippines but definitely around the world. A remarkable reason for this is because it is easy to cook and I think most people love or cannot resist the taste of grilled dishes. This recipe or dish is something that you usually see on beach parties, out of town vacations, or simple get to together. We had this dish as a viand and pulutan (finger food, snack, bar food) at the same time as it was a perfect pork dish for a late night drinking session in Tagaytay, where the weather is cold. We just had a hard time setting up the flame as it was misty making the charcoal a bit moist. As mentioned in our previous post, Beef Bulalo Recipe, we had this dish when my friends and I visited Tagaytay. We are sharing the recipe for this good food as most Filipinos love it and it is easy to prepare and cook. Plus the fact that it complements any soup dish as well. Cooking Inihaw na Liempo recipe is as easy as cooking any grilled dish. Just make sure that you marinate it well to make it tasty and yummy. If you cannot find pork belly in your location, or nearest supermarket, you may use pork chops instead. And if you have more time preparing other dishes, check out simple tofu recipe that we have to add more options for your family or guests. Slice the liempo (pork belly) lengthwise - about 2cm (3/4 in) wide or have it sliced in the supermarket where you bought it to have a perfect pork belly cut. Combine garlic, Sprite/7-up, vinegar, sugar, and pepper in a bowl. Pour over liempo (pork belly). Cover and marinate 3 to 4 hours in the refrigerator. When ready to cook, drain the pork and discard marinade. Heat grill to medium and grill pork until thoroughly cooked, about 15 to 20 minutes on the first side and 10 minutes on the other. Make sure that the pork is not burnt. To make the Vinegar-Soy Dip; combine onion, vinegar, soy sauce and pepper in a bowl. Stir well to blend. If you wish to have a spicier dip, add the sliced chili according to your preferred amount. Serve the grilled liempo (pork belly) with the dip and cooked white rice. Most Filipinos love to eat this dish. Try out this Grilled Pork Belly Recipe at home and let us know the experience by commenting below. Share how easy it is to try home cooking recipes with your friends. Lovely and vibrant! I can’t wait to make it for family.